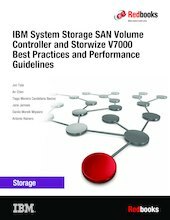 This IBM® Redbooks® publication captures several of the preferred practices and describes the performance gains that can be achieved by implementing the IBM System Storage® SAN Volume Controller and IBM Storwize® V7000 powered by IBM Spectrum Virtualize™ V8.1. These practices are based on field experience. This book highlights configuration guidelines and preferred practices for the storage area network (SAN) topology, clustered system, back-end storage, storage pools and managed disks, volumes, remote copy services, and hosts. Then it provides performance guidelines for SAN Volume Controller, back-end storage, and applications. It explains how you can optimize disk performance with the IBM System Storage Easy Tier® function. It also provides preferred practices for monitoring, maintaining, and troubleshooting SAN Volume Controller and Storwize V7000. This book is intended for experienced storage, SAN, and SAN Volume Controller administrators and technicians. Understanding his book requires advanced knowledge of the SAN Volume Controller and Storwize V7000 and SAN environments.